Snow Queen | Pony Ornaments Figurines | One Price Low Flat Shipping! 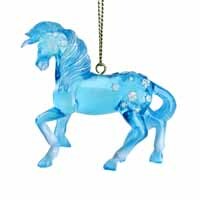 From the Trail of Painted Ponies 2016 Holiday Ornaments Collection, Snow Queen Hanging Horse Ornament. Made of stone resin. Measures 2.5" tall. Packaged in collectible gift box. This unique glass blue ornament inspired by the movie, Frozen, transmits a feeling of peace and tranquility.